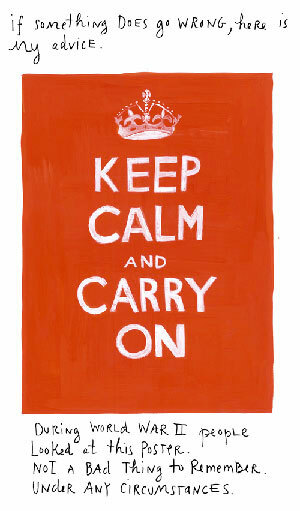 A brief history: the Keep Calm and Carry On poster was a British WWII propaganda piece; that much you probably know. What you might not know is that it was designed to be rolled out to keep up morale only in the event of a national catastrophe, or German invasion of Britain. Oddly, even The Blitz was not deemed poster-worthy, because nearly the entire 2.5 million copy print run remained in storage through the war and was destroyed thereafter. EDIT: Commenter Dr. Bex L., PhD wrote her thesis on “The Planning, Design and Reception of British Home Front Propaganda Posters of the Second World War” [If contentville, was still around I might have just impulse bought it] that contains the most thoroughly researched background on the commissioning of the original poster I have seen, amassed from government memo. She’s reproduced the relevant section on her blog. One of only a handful of known existing copies was unearthed by a Northumberland bookseller at the bottom of a box of books in 2000. He hung it in his shop, and after repeated offers to buy it, arranged to make reprints. Heâ€™s sold over 40,000, mostly since 2005 when it was featured in a holiday supplement. Since that time, the design has become the most runaway public domain success story I can think of. I first became aware of it through sfgirlbybay’s reprints — I’d personally credit her for popularizing it in the American interior designy/posh scene (Domino, Blueprint, design*sponge, Apartment Therapy, etc.). Because this was the way I first learned about it, it has always maintained a sort of luxe girl look to me (and there’s nothing wrong with that; some of my best friends are luxe girls). Her chocolate brown, pink, aqua and especially silver colorways really are the fashionista bee’s knees. Clearly the original — in red, not coral — appealed to patriotism and monarchy for resolve during a time of unbearable grimness. The reprints have maintained some of that spirit — certainly the design’s momentum in 2009 makes me feel like it’s the world’s best economic-optimism-in-the-face-of-bleak-reality slogan. And yet, even back when I latched on in 2007, it felt like a mantra to hum to yourself to ease the queasy feeling Bush & co gave us. That said, I was always bugged that one reading was, Keep Calm and Forget What is Going On In The World. All sorts of printers, designers, and shops — virtual and real — are printing up and selling their versions and variations (etsy has over 1000 matches for “keep calm” and a shocking number of them don’t come close to matching the type [though admittedly it's tricky]). Mike Coop of keepcalmandcarryon.com (whose history page is referenced by many a blogger as authoritative, but I disagree) tried and failed to have the phrase copyrighted. I saw an enormous version as a window display at the womenâ€™s boutique Jigsaw. I asked where the poster was from, and was told by the store manager that the UK-based company’s president had come up with the idea to use the campaign, and that they commissioned the printing themselves. I imagine the sheer number of poster sellers, the availability of the slogan emblazoned on every last thing, and the parodies (the ones that address head-on the act of making parodies of the posters are my favorites) may weaken and ultimately sink this runaway design, but it doesn’t look to be happening anytime too soon. And it’s fascinating to me, unlike so many trends I have witnessed, it’s not big companies identifying and going after this, it’s a hundred smaller sellers making it their own, finding microniches: lip balm, stamps… That said, the first sneaker company to manufacture Keep Calm on the left foot and Carry On on the right (I hope its Onitsuka Tiger myself but Adidas, Blackspot or Ben Sherman would all work) will win my heart. Gentlemen, I don’t expect commission but a free pair would be great. I wear a US size 8. 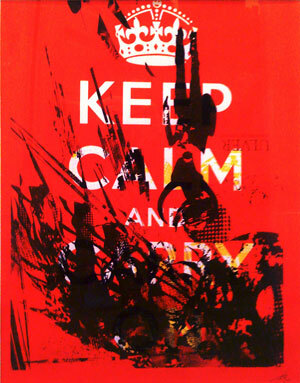 In the UK (judging from the BBC and Guardian pieces) the Keep Calm poster has both more widespread cultural recognizability (here I think less than one in fifty know of it whereas in Brighton there’s a moving company that’s adopted it as their name and slogan!) and a slightly different set of associations. There is a bit more nostalgia and patriotic comfort in the UK’s take in its association with a less complicated age. Which is why the perfectly Orwellian Policing Pledge posters really irk me. What began as a poster giving a message from an imperiled state to its fearful populace in Britain 70 years ago has been revisited as a series of posters that seem to instigate fear in the current British populace — or at least a portion of it. The police are not here to create disorder, they’re here to preserve disorder. -Richard J Daley. It’s one thing to parody/homage this poster if you’re not in power, but when you are, adopting this format and direct address is bound to come off heavy-handed and totalitarian. During WWII, Britons would no doubt have been comforted in seeing this message from their queen & country — but in the current unbesieged state how repressive it must seem to be spoken to by an authoritative, yet invisible, Big Brother who writes in all caps about surveillance and the changing relationship of citizens vis a vis police? Have you ever seen such unironic doublespeak as You Have the Right Not to Remain Silent? This verbal reversal might as well read “Freedom is Slavery.” Anything You Say May Be Taken Down and Used as Evidence is a chirpy reminder that you are being watched by those who yes, may prosecute you for thoughtcrime. And We Have Good News and Bad News Depending on Who You Are seems like an admission on the part of the police of selective protection and repression. I for one feel much safer imagining the police to be, by law, impartial. I can only imagine how scary one of those posters must be to anyone who sees themselves as on the Bad News side of Big Brother’s new pledge. There’s one I didn’t feature that says We’d Like to Give You a Good Talking To. Now, I know they were trying to be clever and have this turn on its head to mean, We Want to Communicate. But instead, in this format, the wink indicates …and We Talk With Our Cudgels. Brazil (originally titled 1984 1/2) and Children of Men are two of my very favorite movies… but I’m quite glad I don’t live in them. EDIT see English/Welsh blogger Carl Morris’ commentary here. Will the state’s terrifying reappropriation of this meme be its death knell, or will the original poster come to flourish as a symbol in opposition and defiance to the Policing Pledge — Keep Quiet About Your Subversive Activities and Carry On With Them and One Day We’ll Overcome the Pigs? Time will tell. I’ll wrap up with the poster of the poster we own — a test print/monoprint purchased at Treasure Island Music Festival 2007 from Lil Tuffy. I guess even in the halcyon days of summer 2007 I was feeling like what this poster needed was some old-fashioned havoc lest Calm become Complacent. If you’ve got any Keep Calm stories or versions or especially if you’re British and want to fill me in on the societal relevance of the original and the reaction to the new Policing Pledge ones, please do comment. Love the “now panic and freak out” tee. A must have for the modern women. So loving seeing this poster take off, I spent several years of my life studying wartime posters, and am working on my book proposal, but meantime some material on: http://ww2poster.wordpress.com/ and http://www.ww2poster.co.uk! nice article this, and thanks for the link. Wow fabulous! I just updated the post with a link to your research on the memos regarding the original. After finding a lack of authoritative consensus (even on wikipedia) when I was looking into it the last week, it’s great to have the primary documents called out about its commision. Samantha and I fell in love over propaganda posters: when we moved in together we discovered each had a copy of the dover book of war poster reproductions for instance. Dear to both of our hearts. I’m not sure I’d classify Wikipedia as “authoritative” (especially when it appears in my student’s essays), and especially as they have removed any links I have added to my Keep Calm specific blog! Your blog article is really interesting, and thanks for the extra mention. Was adding an entry on London Transport last night when my internet connection hung, so finished it tonight! Oh I didn’t mean that wikipedia is authoritative on its own, only that it cites its references and is generally without agenda, unlike for instance keepcalmandcarryon.com’s history page which bugs me in indefinable ways. I’ve never been a contributor so I’m not sure what their regulations are but it seems like their references are primarily journalistic (including sometimes articles from established web journalism like Slate) and not often primary sources or scholarly texts. That said, I think they probably have a regulation against citations to blogs, which usually are not vetted, fact checked, or necessarily stable links. Perhaps if you added information and referenced back to your thesis, as the Browser Books history page does, it would be accepted? I think you uncovered in memos information that was lacking on that page and should be there. Great ‘talking’ with you, as it were, and thanks for the link in your London Transport poster post as well.